THE AFL's hottest property, Lance Franklin, was reported as Hawthorn won a thriller against Adelaide at AAMI Stadium. In the last quarter the Hawks found that special something that has put them on top of the ladder to beat a valiant Crows outfit in a pulsating thriller at AAMI Stadium on Saturday night. The Crows kicked the game's first two goals and led narrowly at every change but succumbed to the Hawks' greater composure in the final minutes, with the visitors winning 11.10 (76) to 10.12 (72). It was Hawthorn's first win against the Crows in Adelaide since 1994. The result, as significant as it was, was overshadowed by Franklin's report, which threatens his Brownlow and Coleman medal hopes. He was booked by umpire Michael Vozzo nine minutes into the second term for a head-high, front-on bump to Michael Doughty, adding further intrigue to a night of high-quality football. Despite kicking only 1.6 opposed to in-form Adelaide backman Nathan Bock, who managed 35 possessions and 16 marks, Franklin had a significant influence by playing up the ground in the last term. His forward offsider Jarryd Roughead (three goals) played a fine game against Ben Rutten, while the midfield expertise of Luke Hodge and skipper Sam Mitchell was vital at the death. Jason Porplyzia (three goals), Scott Thompson and Graham Johncock were all fine performers for Adelaide, which strengthened its standing as top-four contenders by pushing the Hawks to the end. The Hawks were also set back by the loss of key defender Chance Bateman to an apparent hamstring strain late in the second term, having entered the match under the cloud of a corked thigh. 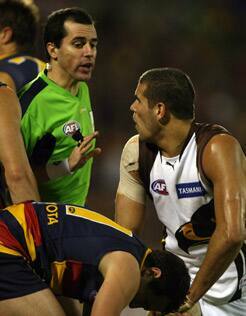 Adelaide lost Nathan Bassett early to a suspected neck/shoulder injury, and missed his experience late in the match. Both sides lost players prior to the first bounce, with Hawk Trent Croad failing to shake off a hip complaint and replaced by Thomas Murphy while Crows prime mover Brent Reilly (hamstring) gave way for childhood Hawthorn supporter Andy Otten to debut for Adelaide. The Crows managed to get the jump on the contest, notching five scoring shots for 2.3 inside the first five minutes. At that point Hawthorn had barely touched the ball, but they were to ease back through the remainder of the term and only one point separated the sides at the break. A pair of early majors to Tyson Edwards and Richard Douglas extended the Crows' lead briefly but Mark Williams cut that back with a fine finish before the game was given its key talking point by Franklin's report. Williams' second, this time from a tight angle, gave Hawthorn a momentary lead, only for Porplyzia to convert to regain the advantage for the home side. Franklin roamed up the ground in a largely fruitless search for kicks in the third quarter. The Crows soaked up minutes and held possession in the back half for long stretches, and as the quarter entered time-on the tactic appeared to work, Porplyzia nailing two goals in a minute when a critical Campbell Brown turnover was quickly followed by Edwards' centre clearance. Hawthorn's response was to fire through the next two goals through the perservering Roughead, and the game remained desperately tight as it entered the final term with the Crows holding a three-point lead. Neither side could lay a game-breaking punch early in the last quarter, a goal for goal start leaving only two points between the teams entering time-on. Hawthorn eventually broke the sequence through Hodge, who kept his head to kick truly and put the Hawks in front when it mattered most. Reports: Franklin reported by umpire Vozzo for making high contact on Doughty in the second quarter.